Ganesh or Ganapati, the endearing elephant-headed god and son of Shiva and Parvati, is perhaps the most popular deity in the entire Hindu pantheon. The name Ganesha or Ganapati, meaning the ‘Lord of Hosts' or 'Lord (Skt. isha or pati) of the Ganas’, with the term gana referring to the category, class or ‘host’ of dwarf-like deities that mainly serve as the attendants or minions of Shiva. But the names Vighneshvara, the ‘lord of obstacles’, and Vighnataka, the ‘destroyer of obstacles’, more accurately describe Ganesh’s dual-function as being both a ‘creator of obstacles’ and the ‘remover of obstacles’. As the ‘Lord over all Obstacles’ Ganesh is the supreme Hindu god of wisdom, knowledge, success, prosperity and good fortune, who is always invoked before any new project or business enterprise is undertaken, such as laying the foundations of a building, making a journey, getting married, learning to drive, etc. He is likewise propitiated before any spiritual practice or religious ritual is undertaken, with the sole exception of funeral rites, which are considered inauspicious for a deity such as Ganesh. Along with Sarasvati he is a patron deity of education, science, intellectual studies and the arts, where he is invoked before sitting examinations, giving performances, enrolling as a student, writing a book, and even before children start to learn the alphabet. Although there are hundreds of Ganesh images and shrines within the Kathmandu Valley, his four main aspects, known as Vinayak in the Newar tradition, each have four-arms and their own unique temple. These are: blue Ashok Vinayak; red Surya Vinayak; white Jal Vinayak, and white Chandra Vinayak. White Chandra Vinayak, or ‘Moon Ganesha’, is depicted here and his blessings are said to be beneficial in curing all kinds of diseases and injuries to the body. 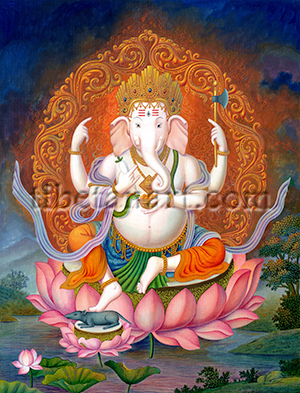 He is radiant white in complexion and sits facing forward upon the white moon-disc of a pink lotus, with his right foot resting upon his long-nosed shrew vehicle, who in turn rests upon the small white moon-disc and pink lotus that serves as Ganesh’s foot pedestal. The chuchundra, or long-nosed Asian shrew, is able to enter the smallest of apertures, in contrast to the massive pot-bellied form of Ganesh, as the largest of all living creatures. Ganapati’s stout white body is adorned with a red loincloth and a blue upper skirt with a pleated green apron. A long billowing silk scarf entwines around his body, and he wears golden ornaments, a five-jewel crown with an ornately pleated head-dress, with the naga-serpent Vasuki encircling his chest as a sacred thread. He has three small piercing eyes, large ears, and his forehead is marked with the three vermilion lines of a Shaivite tripundra. His dexterous trunk serves as his extra hand (Skt. hasta), and his right tusk was broken from an axe once thrown at him by Vishnu’s incarnation as Parusharama, from which he received the name Ekadanta or ‘one-tusked'. Although a later legend relates that he snapped off this tusk when he was transcribing part of the great epic ‘The Mahabharata’ for the great Rishi Vyasa, when the tip of the stylus Ganesh was using broke. With his first right hand he holds his favorite vegetable, a white radish (mulaka), and with his first left hand he holds a golden bowl full of laddus, his favourite Indian sweet. With his second pair of right and left hands he holds aloft a rosary of rudraksha beads, and an axe. Ganapati is encircled by flames within a torana-like archway of entwining golden scrolls, and he abides within a natural landscape and above the tranquil waters of a lotus-lake.